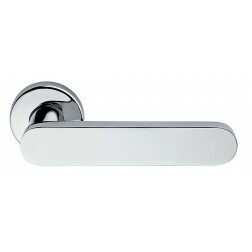 Interior door handle Apro Cometa series on round rose key hole. *Choose the finish you need in interactive configurator. *Technical drawing with the dimensions of the handle available in the images. One of the most beautiful handles and search by users, for modern environments, recommended in polished chrome, beautiful and elegant. The our company generated the idea of a new challenge. A project aimed at the commercialization of new products that complete the experience in the field; we created the brand Apro. An agreement with important trading partners worldwide manufacturers of the sector, which has always combine design, quality and price to satisfy everyone's needs in everything that can be connected to the meaning of the brand. The mission is aimed at professionals specialized in the field of windows that directly entertain and assist the end users. Interior door handles recommended by Apro, are produced with the best leagues where the surface is protected with a paint fire with high adhesion and excellent resistance to solvents and chemicals. 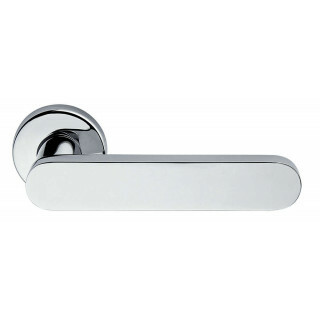 All our handles and accessories are provided by our warranty on function and finish for many years, helping to save money and the environment. The seriousness and professionalism, the enthusiasm and the desire to get in the game constantly, are the hallmarks of this company making it competitive and a leader in her sector. Specializing in designer handles and accessories unique in the genre. Apro offer modern handles, sets for sliding doors fortified with svarowski set accompanied by the finishes like satin chrome polished chrome or polished gold. The handles are certified for a correct operation lasting for years, obviously following the correct procedures of maintenance and cleaning.